Copyright © 2008 SUV Rollover Lawyers Network serving SUV rollover victims including tread separation and tire blow out cases. Disclaimer: The SUV Rollover Lawyers Network services all 50 states including Alabama, Alaska, Arizona, Arkansas, California, Colorado, Connecticut, Delaware, Florida, Georgia, Hawaii, Idaho, Illinois, Indiana, Iowa, Kansas, Kentucky, Louisiana, Maine, Maryland, Massachusetts, Michigan, Minnesota, Mississippi, Missouri, Montana, Nebraska, Nevada, New Hampshire, New Jersey, New Mexico, New York, North Carolina, North Dakota, Ohio, Oklahoma, Oregon, Pennsylvania, Rhode Island, South Carolina, South Dakota, Tennessee, Texas, Utah, Vermont, Virginia, Washington, West Virginia, Wisconsin and Wyoming. This does not mean, however, that all SUV rollover cases will be accepted and we reserve the right to decline any representation. 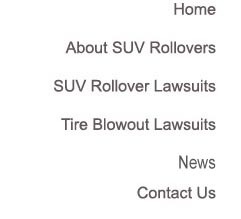 This site only provides information about sports utility vehicle rollovers, tread separation, and tire blow outs, it is not meant to be taken as legal advice. Click here for more This website is not intended for viewing or usage by European Union citizens.